Colorado Springs boasts not only six military installations (Air Force Academy, Buckley Air Force Base, Peterson Air Force Base, Schriever Air Force Base, Cheyenne Mountain Air Force Station, and Fort Carson) , but also the North American Aerospace Defense Command (NORAD), U.S. Northern Command, Air Force Space Command, U.S. Army Space and Missile Defense Command/Army Strategic Command, Missile Defense Integrated Operations Center, Space Innovation and Development Center, Joint Functional Component Command-Integrated Missile Defense, and the National Security Space Institute. Whether it was a marketing tool or a morale boost, several of these installations released records featuring its more talented soldiers and airmen (we'll feature several of these recordings in later posts). 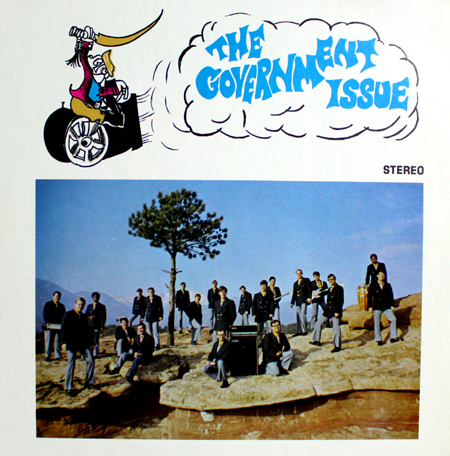 In 1970 Fort Carson (which is actually celebrating it's 70th year, this year) formed The Government Issue as "expressly for the entertainment of the Army soldier and expanded to act as ambassadors to the people of the Pikes Peak region." 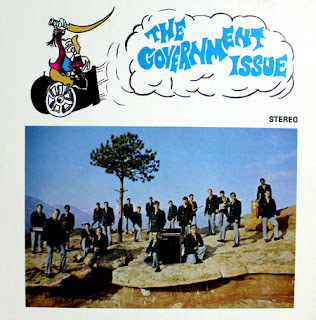 Released on the prolific John Law Enterprises label (710501), the group's self-titled LP keeps it pretty safe with your typical Up With People-style selections. A few stand-out performances, including a soulful rendition of the Beatles "Something." "Dino's Song" is actually a cover of the Youngbloods "Get Together," not the Quicksilver Messenger Service song. I guess they changed their mind, and forgot to tell the guy in charge of printing the LP cover. 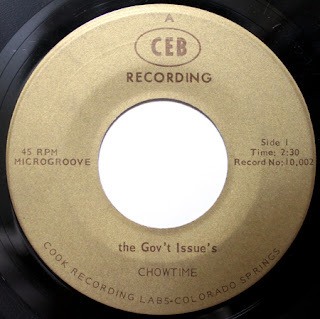 There is one other Government Issue release, a 45 on the CEB label (10,0002-no year). "Qui'Cest Ca (What is This)" and "Chowtime" are both happy little horn-driven instrumentals, interspersed with comic relief. Interesting note: Guitarist Mario Tio, who is featured here, is the same Mario Tio who went on to be one of the founding members of Chocolate Milk - the New Orleans-based funk and soul group, and who also worked with Allen Toussaint, and recorded with Paul McCartney (Venus and Mars sessions).